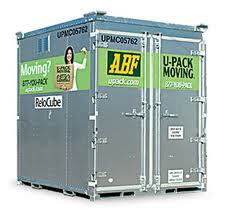 ABF U-Pack is one of the best known low-cost moving companies in the United States. The company itself claims that over three-quarters of its customers choose U-Pack because of their low prices. In 2011, less than 1% of U-Pack’s customers made claims relating to goods damaged in the moving process, a record that matches up to virtually every other company. U-Pack claim to take less than 5 days on average when it comes to moving goods cross-country. Another reason why customers choose this company is because they use separate trailers for each customer rather than placing the goods of several homes in one truck. One of U-Pack’s innovations is their ReloCube, a special container designed to make moving convenient and affordable. You are allowed to choose as many ReloCube containers as you need BUT you only pay for the number you actually use. The container is delivered to your home and you complete the process of loading your possessions into the ReloCube. The container is 84 inches wide, 100 inches high and 75 inches deep and is estimated to have the capacity to fit one average sized room’s furnishings or a maximum of 2,500 pounds. The floor and frame of the container is aluminum with fiberglass/aluminum walls. There are slotted vertical aluminum wall studs with welded roof seams that are waterproof. There are two doors on the front which have steel latches and are secured with two padlocks. Weatherproof: The container is extremely well-built and its sturdy construction ensures that inclement weather can’t damage your goods. Convenience: Despite the vast amount of goods that can be stored in a ReloCube, it is small enough to park in your driveway. Easy Loading: There are no stairs or awkward steps. The container is flat on the ground so loading and unloading is easy. Top Notch Security: The doors are rock solid and have steel latches. You can use your own padlocks to prevent intruders from stealing your goods. Low Cost: U-Pack compare extremely favorably to rival moving companies. We asked for quotes from other well-known companies and found that they charged more than double U-Pack’s ReloCube price in some cases. U-Pack has a trio of delivery methods when it comes to bringing the ReloCube to your door. The flatbed trailer is the most commonly used piece of equipment. It is brought to your home with a forklift used to complete the job. The Drop-Deck trailer is used for small orders of up to 3 ReloCubes. The Liftgate van is used for larger jobs and can only be used on flat and level surfaces. The ReloCube is a real life-saver for families looking for a quick and affordable method of moving goods from one home to the next. It is fast, reliable and offers tremendous value for money. The containers are clean, durable and safe. Thousands of customers use ReloCubes each week and few ever show signs of dissatisfaction, quite a feat in the moving industry. The ReloCube comes highly recommended. Save $50 off long distance moves with our Upack promo code.